Chase Lorg (#33) scored on this 25 yard Seth Boomer TD pass with just a minute left before half time. Lorg then kicked the extra point for a 7-0 score. Brett Erickinson (#11) and Justin Prather (#14) broke up this Claremore pass attempt in the closing seconds of the first half. Coach Ben Davis talked to the freshman during the short half time break. Coach Tom Redding had some additional tips for the offensive line (L-R: Nick Jensen (#54), Bradley Smith (#73), Jackson Wilson (#61), Joey Krupinski (#70), and Nathan Schaffner (#58). Justin Prather (#13) with a 3rd quarter run. Blake Burd (#28) scored on a 20 yard TD run with 6:47 left in the 3rd quarter. Chase Lorg's PAT kick set the score at 14-0. QB Seth Boomer (#12) scored on a 44 yard TD run with 4:11 left in the game. Chase Lorg's (#33) kick (from Seth Boomer's hold) made the score 21-0 which turned out to be the final score. At least six (& maybe 7?) freshman tacklers stopped this Claremore ball carrier late in the game to protect the defensive shutout.. The Collinsville Jr. High football teams competed against the Claremore Zebras Thursday night in a Metro Lakes Conference battle at Sallee Field. The 7th grade game was one of the most exciting games to be played at Sallee Field since the last second victory over Skiatook last Friday night. The Zebras and Cardinals went into double overtime in a slugfest. Late in the contest, the Cardinals made an unbelievable catch in the end zone to win the conference battle 12-6. The catch was made in same spot where TJ Johnson made his game winning catch against Skiatook last Friday night. Vince Gregory reported a mild knee sprain. He is expected to see action next week. The 7th graders improved their record to 1-1. The 8th grade Cardinals had trouble corralling the Zebras. Claremores big backs ran hard and fast. The offense of the Cardinals could not move the ball consistently. However, the kicking game did show signs of improvement. The Zebras won 32-0. No injuries were reported. In the 9th grade game, the Zebras had no horsepower. The Cardinals recorded their second shut out of the season. The overpowering running game and aerobatic passing attack of the freshman was way too much for the Zebras. Cardinals won 21-0. The 9th graders improved their record to 2-0. Blake Burd has been diagnosed with a concussion. The tough running back for the Cards will be out for a couple of weeks. We wish Blake a fast recovery. The Cardinals next opponent is the Bishop Kelly Comets. The Metro Lakes Conference games will be played at Bishop Kelly, located at 3905 S. Hudson in Tulsa. Games begin at 5:00. We hope to see you there. There is something I would like to share. After all the games were played, I was sitting at the field house washing dirty uniforms (around 10:00pm) and checked my phone. I had a few text messages. One of them was about a 7th graders playing time. I thought, I wish there was an easy way to fix this. I then noticed the time of the text: It was sent at 5:57pm. Folks, this was during the middle of the fourth quarter! As we move forward, all playing time discussions will only be done face to face. Coachm up. The Collinsville Cardinal Junior varsity football team traveled to Skiatook Monday night for an unscheduled contest. Skiatook had Cleveland on their schedule, but Cleveland was unable to play due to a shortage of players. The Cardinals did not have a game scheduled, so both head coaches got together and believed this would be a good time to play the Highway 20 contest. The game proved to be a continuation of last Friday nights thriller. Both teams slugged it out, up and down the field. The Cardinals offense moved the ball all night. Unfortunately, we missed a couple of field goal opportunities and were unable to cross the Bulldogs goal line. Skiatook wins 7-0. No injuries were reported. 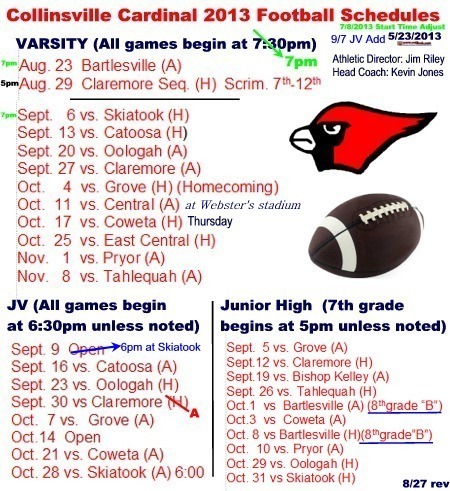 The JVs next action will be September 16, 6pm at Catoosa. The Indians are reported to have built one of the finest football facilities in the Tulsa area. Hope to see you there.